In terms of revenue, the global activated carbon market is projected to expand at a CAGR of 8.2% from 2018 to 2026, according to a new research report titled ‘Activated Carbon Market – Global Industry Analysis, Size, Share, Growth, Trends, and Forecast, 2018–2026’ by Transparency Market Research (TMR). The global activated carbon market is driven by the rise in demand for activated carbon in water & wastewater treatment and gas & air treatment applications. The activated carbon market in Asia Pacific is estimated to expand at a CAGR of more than 8.0% during the forecast period, owing to the increase in awareness about water treatment activities and growth in manufacturing facilities with water & wastewater treatment plants. Based on form, the granular segment held dominant share of the global activated carbon market in 2017. However, the powdered segment also expanded significantly in 2017. This trend is projected to continue throughout the forecast period. In terms of volume, water & wastewater treatment and gas & air treatment segments accounted for large share of the market in 2017. Consolidated market share of these two applications stood at more than 60% of the global activated carbon market in the year. Activated carbon is employed extensively in the water filtration process. It is used in water filtration process for the removal of volatile organic compounds and chlorine from drinking water. It is also employed in wastewater management processes. Increase in industrialization is leading to water pollution at the global level. Most countries across the globe are investing significantly in water treatment activities. Globally, one out of five deaths of children under five years of age is due to water-related diseases. Harmful gases released from industries lead to air pollution on a large scale. Rise in industrialization and emission of harmful gases from chemical industries, coal fired power plants, and processing industries leads to air pollution. Most of the global population lives in places where quality of air is not up to the mark. This is augmenting the need for proper air and gas treatment in industries. Various governments across the globe have enacted stringent regulations related to the standard of air quality. This is anticipated to fuel the global activated carbon market during the forecast period. Activated carbon is produced using different raw materials such as coal, coconut shell, and wood. Coal mining adversely affects the environment and human health. Environmental impact of coal mining includes land use, waste management, and water and air pollution. Burning of coal leads to the production of large amount of waste products every year. This, in turn, causes air pollution. Furthermore, wood is used as a major raw material in the manufacture of activated carbon. This results in cutting of trees to obtain wood, thereby adversely affecting the environment. Activated carbon is also used in food products to detox body. However, human body is exhibiting resistance to absorption of vitamins and medicines due to the heavy usage of activated carbon. This is creating a negative impact on the overall demand for global activated carbon. Recovery of activated carbon from used activated carbon is termed as reactivation of activated carbon. This is done when activated carbon loses its adsorptive capacity. When activated carbon becomes inactive, it can be reactivated using thermal reactivation. Major advantage of reactivation of activated carbon is that the CO2 footprint associated with reactivation is less than that of production of activated carbon. This is the prominent factor expected to create opportunities for manufacturers of activated carbon. Mercury removal from coal-fired power plants offers another major opportunity to the activated carbon market. The U.S. held major share of the activated carbon market for mercury removal application in 2017. In terms of volume, Asia Pacific held prominent share of more than 30% of the global activated carbon market in 2017. The activated carbon market has been shifting to developing regions such as Asia Pacific owing to the comparatively low manufacturing costs and presence of less stringent environmental regulations by various government bodies. China and India constitute key share of the activated carbon market in Asia Pacific due to the expansion in manufacturing facilities in these countries. North America held major share of more than 25% of the market in 2017. However, the market share of the region is anticipated to decline marginally during the forecast period due to the decrease in usage of coal in electricity generation, which indirectly impacts the demand for activated carbon for mercury removal. The market in Europe is projected to expand at a moderate pace during the forecast period. Demand for activated carbon in water & wastewater treatment, mercury emission control, and automotive is anticipated to rise in the region in the near future. The market in Latin America and Middle East & Africa is anticipated to expand at a sluggish pace compared to that in other regions in the near future. The report comprises profiles of major companies operating in the global activated carbon market. Around 90% of the global activated carbon market is consolidated, while the rest is fragmented with a few small players operating in the market. Key players include Cabot Corporation, Osaka Gas Chemicals Co., Ltd., Calgon Carbon Corporation, Haycarb PLC, ADA Carbon Solutions, Inc., Oxbow Activated Carbon, Donau Chemie AG, Evoqua Water Technologies, LLC, and Kureha Corporation. Market players have been profiled in terms of attributes such as company overview, financial overview, business strategies, and recent developments. 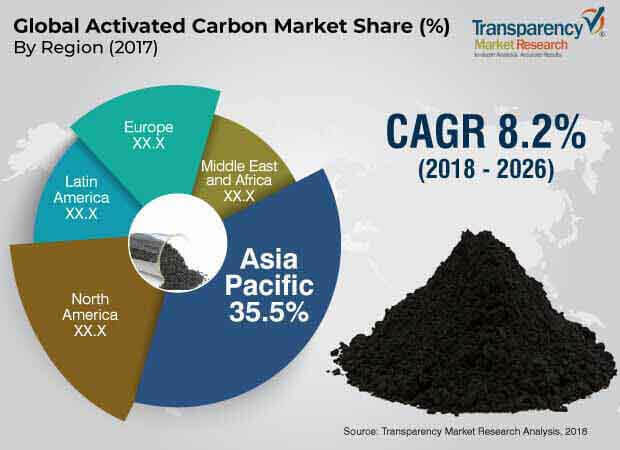 The report also comprises a matrix of comparison between the top four players operating in the global activated carbon market along with analysis of their market share for 2017.